Walk-in closets are the go-to solution for personalized clothing storage. There’s no time like the new year to get a jumpstart on your home storage and organization projects. With a little imagination and elbow grease, your home can be in tiptop shape before you get the itch to start spring cleaning. “The first of the year is a great time to start planning your next storage project,” says Larry Romick, Neil Kelly master carpenter. Romick has worked in Neil Kelly’s home remodeling and handyman divisions for a combined 27 years. In that time he’s built elaborate master closets, organized garages with a surplus of outdoor equipment and created storage solutions for gourmet chefs. He says the key to getting organized is first evaluating how you use a space. Determine what items are housed there permanently, what items move in and out of the room and who else in your family uses the space. Next, determine how you would like the space — and everything in it — used differently. Finally, brainstorm creative solutions. Here are 10 built-in storage solutions to get you organized. Lifted storage options or overhead storage racks allow you to utilize unused space above the garage door. Whether storing Christmas decorations or rooftop carriers for your car, this is the ideal location for items used periodically throughout the year. Above: Cabinet pull-outs make it easy to access items without crawling or reaching. The easiest way to use all your storage space in the kitchen or pantry is with pull-out shelves. Pull-outs allow you to store and access items in previously hard-to-reach places. Whether in the bathroom, home office or bedroom, modern homes require more connectivity for electronic devices. USB ports and electric outlets can be built into cabinets to ensure you stay online and your devices are organized. Floating shelves work in just about any space. Whether it’s the kitchen, laundry room, kid’s room or living room that needs a bit of organization — and visual interest — floating shelves offer versatile storage solutions in a range of styles and sizes. 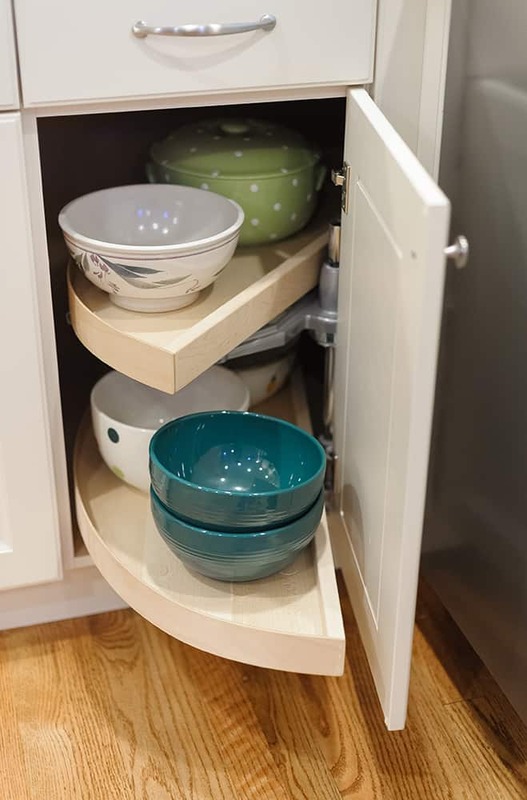 Whether it’s a full circle or half, these storage solutions feature rotating trays for food and appliance storage in difficult-to-reach corner shelves. When you don’t have space for a full drawer, tip-out trays are the next best solution for both kitchens and baths. These sleek, hidden storage solutions are perfect for keeping dish sponges or toothbrushes out of sight but easily accessible. From the simple to the glamorous, walk-in closets allow you to organize your life in the most personalized way possible. Numerous rods, shelves, cubbies and even speciality items like tie racks, shoe racks and lighting solutions perfectly customize master closets, workspaces or craft rooms. Motorized or pulley-operated overhead storage is an easy way to secure kayaks, stand-up paddleboards, skis, bicycles and more. These storage systems allow for easy in and out access from your garage. The bathroom is the most personal space, why not customize it? Adding built-in holders — equipped with electrical outlets — for hair dryers, makeup brushes, cosmetics and more keeps your bathroom counters clean and your daily bathroom or beauty routines organized. Need help getting your home, garage or workspace organized? Our Handyman Services team will get your project off the ground. Speak with one of our skilled carpenters, tradesfolk or designers today.